The 1st of August marks the 43rd anniversary of the death of Nikos Zachariadis, General Secretary of the CC of the Communist Party of Greece (KKE) from 1931 to 1956. He was born to ethnic Greek parents in Ottoman Empire's Edirne (Andrianoupolis) in 1903. At the age of 16, Nikos moved to Istanbul where he worked in various jobs, including as a dockworker and sailor. It was there when he started having his first organised relationship with the working-class movement. In 1919-1922 he travelled extensively to the Soviet Union. In 1923 he became a member of the Communist Party of Turkey. He studied in the newly-founded "KUTV" (Communist University of the Toilers of the East), also known as "Stalin School", in the Soviet Union. After the Greco-Turkish War and the exchange of populations, the Zachariadis family moved permanently to Greece, during a period of severe political and economic crisis. On summer 1924, after finishing his studies in the Soviet Union, Nikos Zachariadis travelled secretly to Greece where he undertook duties at the Young Communist League of Greece (OKNE). In 1926, during the dictatorship of General Pangalos, he was arrested and imprisoned in Thessaloniki. He managed to escape and worked secretly in various party positions. He was re-arrested and re-imprisoned in 1929, but once again he escaped and fled to the Soviet Union. 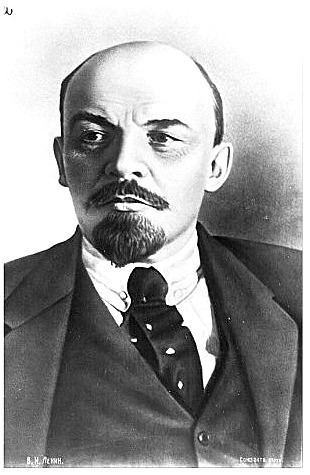 During his stay in the Soviet Union he became a member of the All-Russian Communist Party (Bolsheviks). 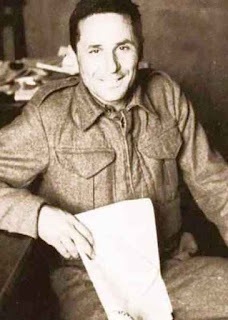 Nikos Zachariadis moved back to Greece in 1931 following a decision by the Communist International and became Secretary of the CC of the Greek Communist Party (KKE). 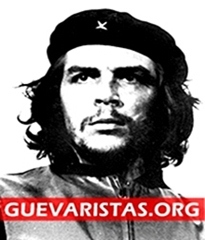 He led the Party during extremely difficult times, especially in a period of harsh anticommunist laws and violent persecutions by the bourgeois governments. He was captured and imprisoned in August 1936 by the State Security of Metaxas' fascist regime. From 1936 to 1941 he remained in prison. After the Nazi German invasion of Greece in 1941, he was transferred to the notorious Dachau concentration camp in Bavaria. Zachariadis was released in May 1945. Returning to Greece he re-assumed the KKE leadership, thus becoming the Party's General Secretary. In the peak of class struggle in the country, he organised the heroic Democratic Army of Greece (DSE) which fought against the bourgeois Army and its imperialist allies (Britain, U.S) during the 1946-1949 Civil War. 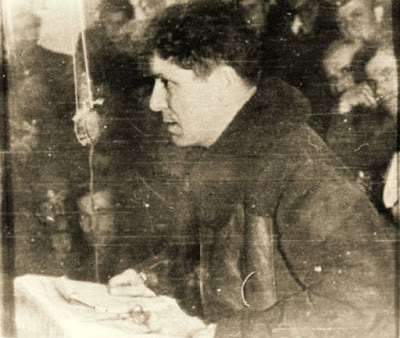 After the defeat of DSE in 1949, the KKE leadership, including Zachariadis, fled into exile in the Soviet Union and the Socialist countries. Zachariadis passed a few years in Tashkent where exiled Greek communists created a large community. The death of Joseph Stalin and the right, opportunist turn of the CPSU had a serious impact in the Greek communist movement. In May 1956, the 6th Plenum of the Central Committee of KKE- significantly influenced by Khrushchev's revisionist leadership- (wrongfully) condemned Zachariadis for "serious mistakes" and "sectarian policy". 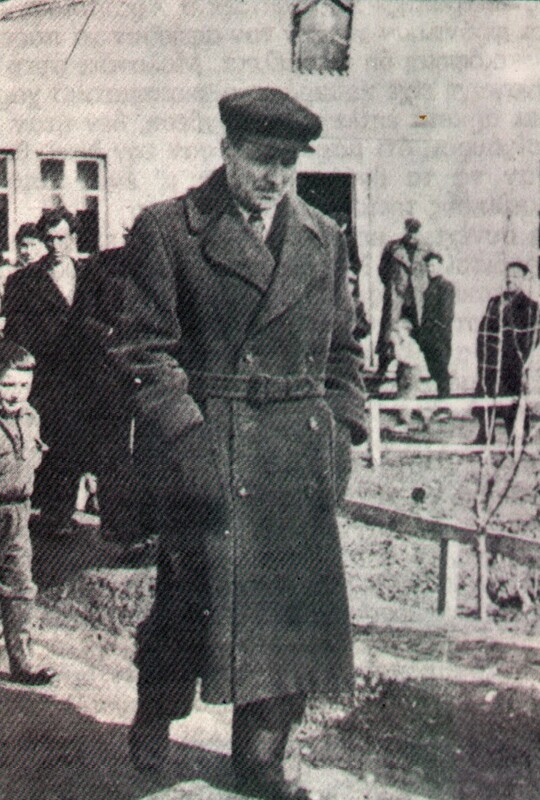 On February 1957 he was expelled from the Party. 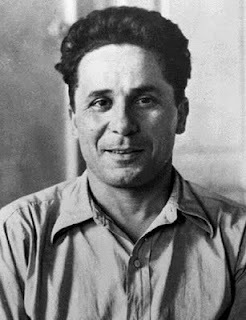 Nikos Zachariadis passed the rest of his life in exile in Siberia, particularly in Yahuta and Surgut. On August 1st, 1973, at the age of 70, he was found dead in his home in Surgut. According to the official account of his death, Zachariadis committed suicide. In December 1991, his remains were repatriated in Greece where he was given a funeral at Athens' First Cemetery. 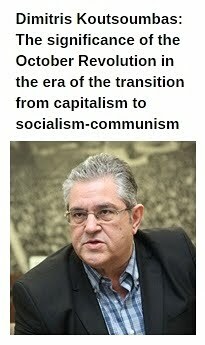 In July 2011, taking a historically and politically significant decision, the National Conference of the Communist Party of Greece fully rehabilitated Nikos Zachariadis as General Secretary and Party member. 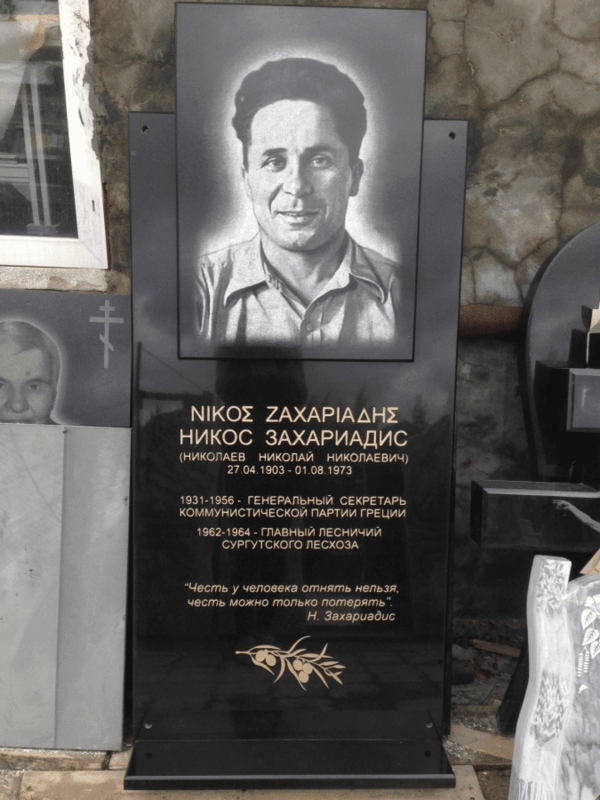 Honoring the memory of Nikos Zachariadis, we publish a speech given by Aleka Papariga (former GS of KKE, member of the CC) in Surgut, Russia; September 7, 2014 / Source: inter.kke.gr. We stand here today filled with respect and emotion in the place where Nikos Zachariadis lived for many years, as an exile, expelled from the KKE on the basis of grave charges for someone who served as the general secretary of the CC for 25 years. In the place where his long life, filled with historical struggles, unwaveringly dedicated to the rights of the working class, the working people, ended painfully on the 1st of August 1973. However, since 2011 he is no longer burdened by any penalty, decision for his purging and suspicion, as in 2011 he was not only rehabilitated as member of the party but also to the position of GS of the CC of the KKE, freed from the slanderous and baseless allegations. 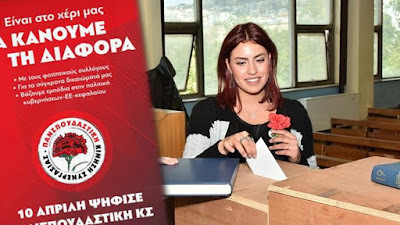 We are here to remind ourselves that 3 years ago the Nationwide Conference of the KKE, after a discussion in which the members of the party took part, we listened to the opinion of friends and supporters in public meetings, came to a decision with the overwhelming majority of votes. This was a decision that many people had been waiting for, ourselves included, for many years, the decision to rehabilitate Nikos Zachariadis, as we have already noted. This decision was the fruit of many years of collective historical research, of the study of all the historical archives that we have available to us. Of course this does not eliminate our sadness about the fact that Nikos Zachariadis remained in exile for many years here in Surgut, isolated form his comrades, with no task assigned to him, without a contribution to the KKE. It does however alleviate it. On this soil, we remember even more intensely how he insisted that the charges were unjust and politically mistaken. We can understand his deep pain, the most unbearable pain that a communist can feel. The class enemy makes you stubborn, angers you, steels you and even when you are suffering in its unbearable torture chambers. But the psychological pain, when the party you loved which you honoured and which honoured you is unjust to you, can not be compared to any physical pain. However Nikos Zachariadis had the consciousness and the courage to believe in the KKE, scientific socialism, the socialist motherland, until the end of his life. 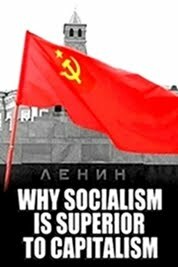 He had one order: no act on the part of the person who had been treated unjustly, there must be no room for attacks on the party, communism, the struggle for socialism. We all know the course of Nikos Zachariadis’ life. Out of respect for the time and chiefly for the reason we are here, I would like on behalf of the CC to limit myself to certain of the many and important issues that exist so that we can explain why his rehabilitation came late and why he was rehabilitated. The most important thing is for us not to forget the collective conclusions that arise from this historic drama of the party. His rehabilitation was certainly delayed, however for many years especially after 1973 and 1974 when certain things had changed in the party, the stance of the party’s leadership and many party members towards Zachariadis was in practice different. The leadership of the party after 1973 had a different stance towards Nikos Zachariadis, understood that the process of rehabilitation should begin through the collective examination of the historical period that concerned him and not just as an isolated figure but as the secretary of the CC of the KKE. After 1974 when the party won its right to legal activity, certain important moments from the activity of Nikos Zachariadis were promoted, especially during the occupation, the framework of the party’s attempt after 27 years of illegality to demand the honouring of the national resistance which had been persecuted after the 2ndWorld War in Greece. So that the contribution of the known and unknown militants could be recognized. These militants who contributed to establishing the vanguard role of the party, which was the main source of the Greek sacrifices in the 2nd World War. We bear in mind that in a period that was difficult for the party and the international communist movement, 1991, when everyone was denouncing socialism-communism, when communist parties were being outlawed in a summary fashion, when others were liquidating themselves, the KKE took the initiative to transport his remains to Greece, from Surgut to a permanent grave in Athens. Of course there are still unanswered questions and queries, unknown aspects surrounding the case of Nikos Zachariadis and which led to his expulsion and his political exile. We began this effort after 1991. We made it clear from the very first moment that the examination of the case of Zachariadis would be carried out in a way that could not be disputed from a historical standpoint, it would not be a sentimental position nor motivated by political expediency. It would not be a rehabilitation just because some people were pressing for it, it would be a rehabilitation absolutely bound up with the history of the party, as Zachariadis’ life was absolutely bound up with the KKE and the International Communist Movement. Examining the case of Nikos Zachariadis, we knew from the beginning that we had to deal with a problem: The separation of several communists or former communists into those who admired him and those who hated him, or in any case said that he played a damaging role. We rejected this separation because it was not scientific, objective. It concealed many substantial issues and it was above all superficial. Even today this separation survives and is mainly reproduced by newer historians that support the capitalist system through their historical work. Also, there are others who ignore the specific historical facts and specific situations and operate in a metaphysical way and do not take the contemporary developments that are rooted in the past into account. Even more so, there are hypocritical admirers of Zachariadis who deliberately approach his contribution in a selective way. They choose a phrase, a section from a speech of his in order to justify their own compromises, promoting choices of Nikos Zachariadis that in the final analysis were not personal ones, but were collective ones and indeed were also linked to the strategic choices of the international communist movement. Others use the tragic case of Nikos Zachariadis to attack socialism and to claim that this struggle is futile and fruitless, that it is better to be an amateur communist in capitalism. Indeed some people claim, others deliberately and consciously and others because they do study in depth the historical facts, that Zachariadis was expelled by competitors for the office of the secretary, because they want to argue that the same things, i.e. the struggle over who sits at the head of the table, allegedly happens in all the parties. Nevertheless they forget that the “chair” in the KKE is full of thorns; that the enemy tries to undermine this position; that the life of the cadre of the KKE has nothing to do with public relations, vote chasing; that is not only beautiful but also incredibly difficult, not only in difficult periods but also in periods which are considered to be relatively calmer. We did not follow the path either of politically annihilating Zachariadis, a path which was chosen in the past and was so unjust to him until his tragic death, or the path of idealisation. 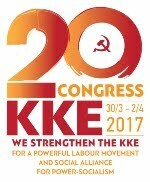 Besides we do not have the right to idealize the historical course of the KKE regardless of the fact that it never betrayed or submitted, regardless of the tens of thousands of people who sacrificed themselves for the workers’ and people’s struggle and will continue to do so as long as it will be necessary. The Nationwide Conference of the KKE assessed positively the contribution of N. Zachariadis as a communist leader and rehabilitates him, rejecting the slanderous accusation which accompanied him for many years, the right-wing opportunist arguments of the 6th Extended Plenum (1956) and other Plenums of the CC as well as the Findings of 1964 and 1967. 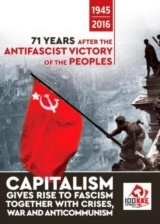 The greatest contribution of N. Zachariadis lies precisely in what the enemies and dishonest friends, the opportunists, dispute: in the foundation and the activity of the Democratic Army of Greece (DSE), the most significant event in the history of the class struggle in Greece in the 20th century. This choice was not arbitrary but necessary. The enemy imposed this choice as they decided to eliminate every single communist in Greece at the time when the imperialist forces which defeated the German fascist axis organized the counterattack using cold and hot war in Europe and all over the world. After World War II there have been tens of regional wars up until the present day. In all cases the culprit is none other than imperialism. The struggle of the DSE was not related merely to the sharpening contradictions within Greece. On the other hand, it was not imported. It arose from them and at the same time it was an internationalist struggle, as apart from the Greek bourgeois class it also concerned its new imperialist ally, the USA. It was a struggle that created a revolutionary legacy of great value. Nikos Zachariadis made a significant effort for this struggle to take into account the socialist character of the revolution in Greece. The contribution of N. Zachariadis includes his unwavering stance regarding the creation and the development of the KKE’s party organizations in Greece regardless of the conditions. This commitment did not decline despite the tremendous repressive measures of the bourgeois state. He didn’t regard party building as a raison d'être but as a factor which along with revolutionary vigilance and the measures to protect the KKE would contribute to the development of all possibilities, even of the slightest one, so as to open at least a small rift for the legal activity of the KKE, for its activity concerning the people’s problems. The Essay on the History of the KKE makes a special reference to his contribution to the building of party organizations under all conditions. In particular there is a reference to the 3rd Conference of the KKE on 10-14 October 1950. Unfortunately the effort of the cadres of the party, headed by Zachariadis to rally its ranks , to achieve the greatest possible militancy and not to submit to the pressure of the enemy was characterized as an “abnormal inner-party regime“ by a section of cadres who claimed that Zachariadis was to blame. This was a crucial moment which led to the problem of the well known events in Tashkent on the 6th and the 7th Plenum of 1956 and 1957 where N. Zachariadis was accused of anti-sovietism, an accusation which was 100% groundless. This accusation amongst other baseless ones, was convenient for the opportunists who presented themselves merely as opponents of Zachariadis and made it difficult for N. Zachariadis to handle matters that in Soviet territory that concerned above all the KKE and the Greek movement while at the same time thousands of members and cadres of the party, small children were enjoying the hospitality and the heartfelt solidarity of the Soviet people and participated in socialist construction. 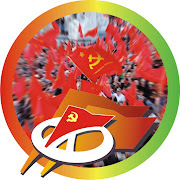 We, the Greek communists have learned from our party all these years not to mince our words, to make criticisms of other communist parties as well. Above all we have learned to recognize our own responsibilities and then afterwards criticize the negative factors at international level which definitely played a role in the developments. 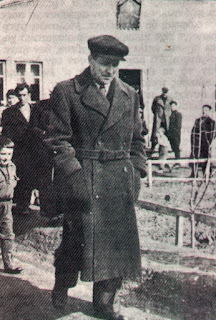 It is well-known that the Greek authorities handed Nikos Zachariadis over to the Germans and that he was detained in Dachau for 4 years. Therefore he was not able to follow the choices and the strategy of the KKE during the national-liberation struggle and thus the underestimation of the need to link this struggle with the transition to socialism. However, the Nationwide Conference has criticized Nikos Zachariadis for the fact that the collective effort to assess the mistakes should have begun after his return to Greece and the liberation of the country. It is not possible to continue a course or change it, if you consider it necessary, without drawing conclusions about the past. We do not dispute the explanation which was given later on by Nikos Zachariadis i.e. that he didn’t speak about the mistaken political line of the party when he returned to Greece because he didn’t want to present himself as being cleverer than the rest and because any effort to change abruptly the strategy of the KKE could have led to a split in the party and EAM, as the party was not prepared to accept this reassessment and change of political line, given that other parties had proceeded to similar choices on the basis of the conditions in their countries. In conclusion, Nikos Zachariadis should have expressed and argued in favour of his views. This does not mean that he would have definitely convinced the party given that the political line of the KKE included all the contradictions of the strategy of the international communist movement. The fact that the Soviet Union was facing unprecedented difficulties both inside the country as well as in its international relations also contributed to his hesitation. Nevertheless, it was necessary for him to make this effort. Besides, it was a period when the enemy had already shown its teeth and there was more evidence and above all tangible warning signs about how the situation would develop after World War II. 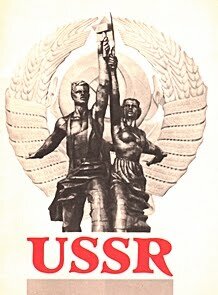 It became obvious that imperialism would proceed to a counterattack and that a part of this counterattack would be the exertion of unprecedented ideological pressure on the communist parties, the labour movement in order to assimilate them and halt the expansion of socialism in Europe. In 1953 Nikos Zachariadis contributed to the formation of a correct strategy of the party: the Draft Programme approved by the Extended Plenum of the CC (12-14 December 1953) set out in detail the strategy of the KKE. The Draft Programme determined the character of the revolution in Greece as socialist however, it reproduced arguments which did not correspond to the correct conclusions. Unfortunately, the difficulty in interpret the delay of industrialisation in Greece and its impact on the position of Greece in the imperialist system tormented our party for many years. This weakness fostered other weaknesses which culminated in the decision to dissolve the party organisations of the KKE in Greece, something that took place after the expulsion of Zachariadis. This decision has had a negative influence on our activity in Greece even up to the present day. We will not refer to other issues. We mentioned some indicative issues for which Zachariadis faced unfair accusations. Even if he could not have contributed himself to the prevention of mistakes , to the extent that this was difficult due to external and internal causes, at least he could have contributed to a struggle that would have saved many communists from the Lernean Hydra of opportunism. The party and its CC went through a very difficult course which lasted for many years in order to study and restore its revolutionary character. That is why it took us so long to rehabilitate Nikos Zachariadis, that is why his rehabilitation took place on the basis of objective criteria. The Nationwide Party Conference that examined the case of Nikos Zachariadis, at an individual level and in the framework of the collective responsibility did not go further than 1968. We will continue with the case of Nikos Zachariadis up to and including his death in 1973 during the drafting of the third volume of the Essay on the History of the KKE; always on the basis of the party archives as well as on any other valid archives, always on the basis of evidence, without any subjectivism. It is certain that regardless of any new evidence that may arise from the study of the period until his death nothing can change the great contribution of Nikos Zachariadis, the lessons to be drawn from his rehabilitation.